Every weekend I've been working on my crumbs and strings - trying to devote at least one good session of working on crumbs and/or strings. (one good session = 2 hours of sewing). I try to do more if I can. At current, I've turned to focusing on blues - trying to finish up my upcycled blues project. Most of you know that I started off with 6 boxes of pieces of (mostly) clothing and have set it as a goal to get to 2 boxes of various pieces. I'm getting close to finishing up this project. But I'm not there yet. What did I do this weekend on this project? 1. Added the next three little borders around the star middle. 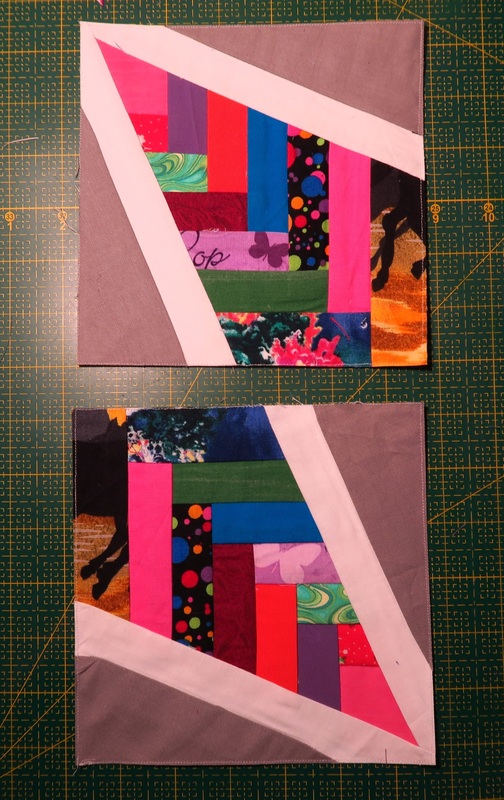 Each of these borders finishes at 1", so I was working with 1.5" strips. The only way I could do that strip of crumbs - I starched a section of my "crumb fabric" and then cut it. Starching helped it stay in place while I sewed it on. When you make crumb fabric, the edges are at all different angles - certainly no "straight of grain" there - so starching helps incredibly. The more the better! Starching it so much that it is stiff as lightweight cardboard works - and is even good in this case! These little stars finish at 6 1/2" square at this point. In the quilt they will finish at 6". 2. Made 3 small stars that will be part of the star border. I still need several. Hopefully next weekend I can finish up those stars. I only have 4 done total - need 12 more. 3. Added about 2 more yards of strips to some narrow adding machine tape for an idea I have for yet another blues crumbs quilt. Before trimming. I added about 2 more yards of scraps to this tape. While it's not in my plan to use it at this time, I'll come up with something if I fill up the whole roll of paper tape with blue scraps. My roll looks like this. I can do this kind of sewing when I'm pretty tired as it doesn't involve anything technical or really any decisions about anything. Just put a piece on and go on. No worries about color, half square triangles, measuring, or anything. 4. Made 2 more paper pieced bright partial stars to eventually go into a quilt top made of these scraps - I'm pulling from my bags of strings/crumbs to make these blocks. So far my grand total of these blocks is - 5! Yes, 5. I'll be working on this one for quite a while. The good thing is, I'm already seeing progress in how long it's taking me to make a block. I'm definitely getting faster. My total number of blocks finished. I'm just getting started on this particular project. It is definitely a "long term" one. I expect it to pretty much take the rest of the year if not longer. Here's the plan for this current crumbs project. I am ready to add the royal blue border and then another little gray one. Then the stars. I only have a total of 4 stars made, but hopefully next weekend I can make the rest even if I don't get them on. I started this project a little less than a year ago because I had so many strings/crumbs that I wasn't using at all - ever. I decided to set a limited amount of time (weekends) that I would feel the need to use these pieces in an effort to at least begin to tame them. As a result, I've finished several tops so far. Here are the strings or crumbs tops I've finished, I included Crumb Pizzazz - the black and gold one - my first ever crumbs quilt.